Ketut Liyer became very famous and sought after by many people since a movie shows the figure of a traditional healer in Ubud Bali, Indonesia. The house belonged to Ketut Liyer not only as a residence, as well as a home stay that can be rented for overnight by the tourists who want to stay in Ubud, Bali Indonesia. Home stay in Ubud very much, most of the house at Ubud can rent for a place to stay. Rental price per night at the home stay owned by residents of Ubud is very inexpensive and can be selected according to the desired location. Ketut Liyer have one house that is used as a home stay, is also home to her son. 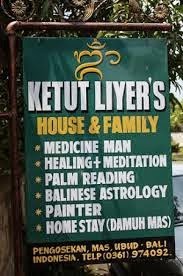 Home address belongs to Ketut Liyer very easy to accomplish. Being on a solid path toward the center of Ubud. Despite having to go through a small alley to get to the house of Mr. Ketut, but all that can be easily achieved by using a motor vehicle. People who want to meet with Mr. Liyer can ask the residents in the village of Mas (Banjar Pengosekan Kaja). Almost everyone who lives in the village of Mas know where the house belonging to Ketut Liyer. Because Mr. Ketut is very popular among the tourist guides in Bali. In front of the alley toward home to Ketut Liyer there is a signpost that will guide the tourists who want to go home of Mr. Ketut. Everyone who wants to meet with Mr. Ketut had to come early before the road along the village of Mas become crowded. If the tetah crowded by vehicles, it will be very difficult to find a home Ketut Liyer. Because each signposts towards the house of Mr. Ketut will be hindered by a passing vehicle. One thing you need to emphasize to yourself when trying to meet with Ketut Liyer is do not expect to get a satisfactory result when you predicted. Ketut Liyer is one of the characters in that became famous in a novel and movie. Emphasize to yourself that you only want to know the figure of a Ketut Liyer, not to forecast and a vision for your future. When you find a home address Ketut Liyer, you will feel that you are a lucky person. But do not be disappointed when entering the home of Mr. Ketut, and in oelh asked the man to his home on your needs, whether you want to talk with his father, or just look around. If you want to talk with Mr. Ketut, then you will be given a queue number, which means anad have to stand in line if you want to talk with Ketut Liyer. 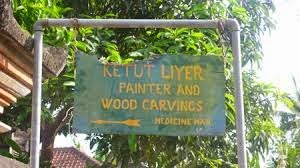 Ketut Liyer home address is the most widely asked by strangers while Ubud. Ketut Liyer phenomenal and famous. People who know about the movie Eat Pray Love, while in Ubud, definitely want to meet with Ketut, and asked residents of Ubud on the home address of Mr. Ketut.